This special show happened during MBS' 'Music Week', held in October 2014. In it, four members of Morning Musume。´14 talked about the Musume。's music history. 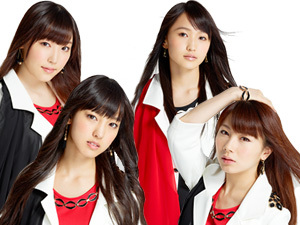 Our hosts for this programme are Morning Musume。 9ki Fukumura Mizuki and Sayashi Riho, and 10ki Iikubo Haruna and Ishida Ayumi. If you missed them, here's the first part and here's the second part. To commemorate the upcoming release of Morning Musume。´14's triple-A single 'Tiki Bun/ Shabadabadoo/ Mikaeri Bijin', the girls will be picking out a random word from the song lyrics, and they'll talk about something related to the chosen word. First up is Tiki Bun! While the other girls go on about how cool it is, Mizuki likes the positive lyrics. 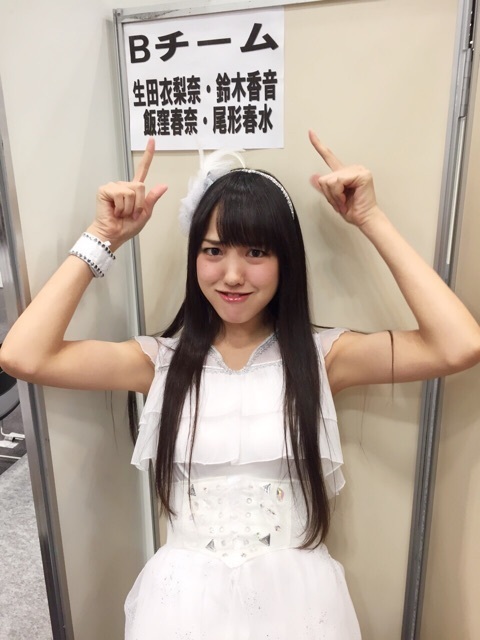 Fuku-chan makes the first pick, and gets 'Uso' - 'Lie', in the sense of not telling the truth. The girls do often tell many small lies, like to family. Iikubo dredges up an incident where she had ice cream from the fridge without telling her mother. Iikubo: And when my mother asked me if I knew what happened to her ice cream in the fridge, I was like 'No idea, I was at work the whole time, I wasn't at home'. Ishida admits that the same thing happened to her recently. Ishida's mother had often been telling her to stop using her phone in the bath, so when it happened, Ishida said that her phone had been left in the wash instead of admitting that it had fallen in the tub. Iikubo: And your mother still hasn't found out? Ishida: I haven't been found out yet. Iikubo: What'll you do if your mother's listening to this show? Sayashi: Let's just keep it to ourselves, okay? Ishida: Please don't spread this story. 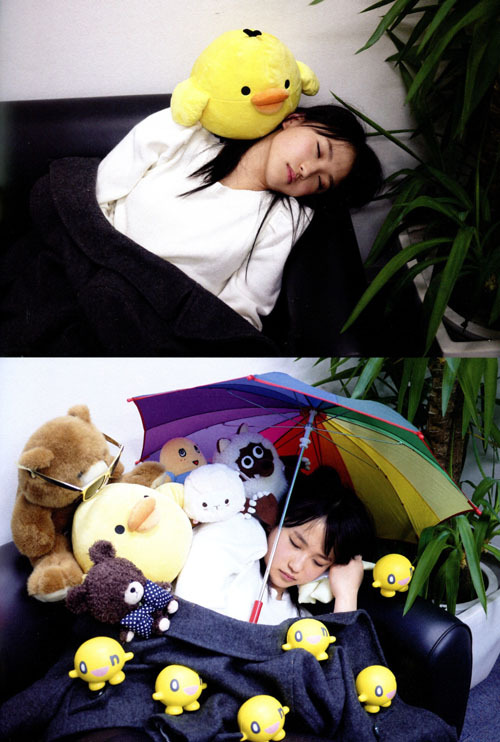 As for RihoRiho, when she dozes off, she'll immediately say 'I wasn't asleep' when she's caught. It's a habit she developed from way back, being defensive when someone catches her nodding off. Coincidentally, the next word, drawn by Sayashi-san herself, is 'Nebusoku' - 'Lack of sleep'. It's something the girls can all sympathise with, and some are them are feeling sleepy even as they're doing the recording. Ishida: It's something to be grateful for, because it shows that we're busy. In fact, the lyrics go 'Nebusoku ha, Neru shikanai' - 'If you lack sleep, the only thing you can do [to deal with it] is to go to sleep'. Iikubo has recently been going to sleep at three in the morning every day. While there are days where they have to wake up early, as well as days where they can sleep in, Iikubo spends quite some time in the bath, and then she idles around doing this or that, and before she knows it, it's three in the morning. Riho finds that she's normally exhausted before she gets in the bath, but feels refreshed once she's done. Ishida will aim to wake up about half an hour before she has to leave her home, just as she did for this radio recording. There's always the issue when she's leaving to stay overnight somewhere. She'll fall asleep while packing, so she really packs in a rush. And hopefully nothing gets left out. Iikubo is the next to pick. 'Hitoribocchi' - 'Alone/By yourself'. This is something that Sayashi is famous for. She's gained the nickname 'HitoRihoRiho', and the managers have a group called 'Bocchi' where they share quietly-taken pictures of RihoRiho all by herself. Sayashi: Well, if seeing HitoRihoRiho makes them happy, well, whatever then. I like everyone, but it doesn't mean that I want to be with all of you ALL of the time, so there are times when I keep to myself. Sayashi: It's like I'm desperate (laughs)! I'm fulfilled with the way our activities are going now. Ishida pulls 'Tokai' - 'The city'. Which basically means Tokyo. Ishida and Riho came from their hometowns to Tokyo, though Riho feels that Ishida's hometown of Sendai is relatively urbanised. Ishida: But you have dreams about Shibuya. Like about 109. Sayashi: Whenever my friends come and drop by Tokyo, they'll be like 109 this or 109 that, it kind of makes me irritated. RihoRiho hails from the boondocks, her home is surrounded by forests, so when she came to Tokyo, she could no longer hear the birdsong. Zukki also comes from the remote countryside, and they've talked about the lack of bird noises ever since they came to Tokyo. The girls have a good laugh as Sayashi makes bird noises to try to explain the noise that she misses. She often hears them when they go to places with lots of mountains or forests. As a Tokyo resident herself, Mizuki has never felt that strong desire to drop by 109. She's only been there once or twice, and before she knew it, the other members had gotten used to the city life. Iikubo: But Fukumura-san, since you're an ojousama, you wouldn't really go there yourself. The girls joke around that Fuku-chan probably sends a butler to do her shopping, as Fuku-chan picks out the next word: 'Lucky'. Something lucky that happened to Ayumi recently was that she didn't get shocked when she dropped her phone in the bath. While for Iikubo, she felt lucky when she just happened to drop by a bookstore and the manga she was following just happened to have come out on that very same day. 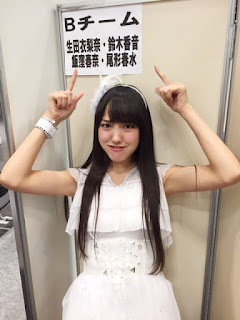 For Fuku-chan, she's recently gotten into acai, around the same time as Michishige-san got into it as well. Michishige-san recommended a store, and Mizuki felt lucky to be able to go to that store with Michishige and Harunan a few days ago. RihoRiho pulls the next word: 'Yatsuatari' - 'Venting one's anger'. RihoRiho associates it with being at a rebellious age, but Ayumi reveals that she still vents her anger at this age. Family is usually the recipient of the outburst. But once they've reflected on their actions after letting loose, they'd give an exaggerated apology. At one point, Riho even cried when she apologised. How they vent nowadays is a bit different compared to their rebellious ages. The girls actually know that they're at fault, even as they let out their steam. But since they're so annoyed, the words would still slip past their lips. Back to lyrics discussion! The song in focus this time around is Shabadabadoo. The girls all agree that it's a cute song, befitting Michishige-san. Iikubo pulls out 'Juuhassai' - '18 years old' - which happens to be around Fukumura and Ayumi's age. Riho thinks that up to now, Fuku-chan's had a mix of childishness and sexiness to her, so turning 18, she'll start to show her full-blown sexiness. Riho-chan looks forward to that. Iikubo: That's not the face that an idol would have. Fuku-chan has heard that girls are at their cutest at the age of 17. But she didn't feel like she spent her 17th year in that way, instead, she was more insecure. So she'd like to do her best when she's 18. While Ishida and Iikubo look forward to the 18-year old Fukumura, RihoRiho brings up Fuku-chan's increased appearances in magazines. 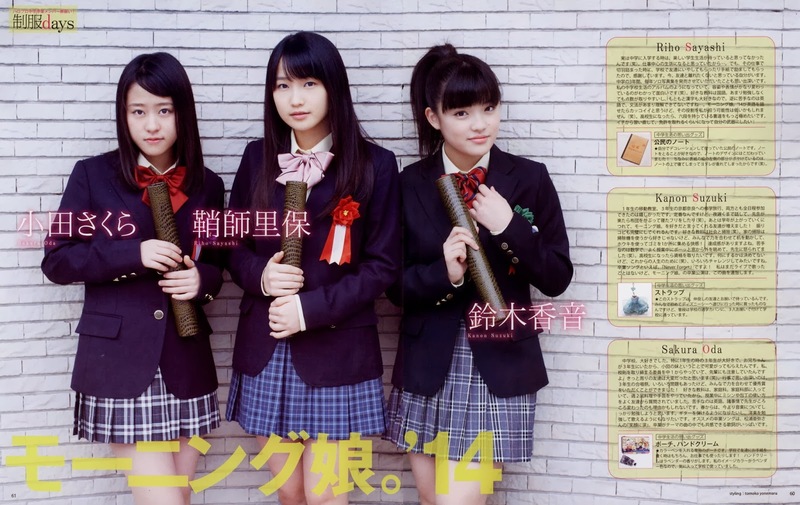 Obviously, RihoRiho bought the GanGan with the poster. Ayumi pulls out 'Densha' - 'Train'. Trains are a regular means of transportation for the members. Iikubo has a bit of a rant about guys who spread their legs when sitting down, eating up space and making it uncomfortable for those sitting next to them. While Mizuki brings up something that is sure to cheer people up: schoolchildren going on an outing, with about 15 kids all fitting into a row of seats. Mizuki's actually really bad when it comes to changing trains, she keeps getting lost. Of course, this leads her to getting teased: it's obviously because she normally gets chauffeured around by a butler. After a humble denial, she states that she usually follows her parents, so she was surprised at her own inability to get to places by herself. But recently she's happy that she's overcome that hurdle, being able to get from Omiya to her destination stations by herself. Of course, nowadays there are all these apps that tell you what transfers to make, but Mizuki still has problems even when she uses them. Ishida: That's definitely because you rely on your butler. The next one pulled out by Fuku-chan is 'Kenka' - 'Fight'. Well, the 10ki are always fighting, year in and year out, despite fighting being an exhausting task in itself. They're mostly small fights though. But for Harunan, she's learnt how to read people, to know when it isn't a good time to bother them. But the 9ki don't really fight, as they tend to move individually rather than as a unit. Contrasted to the 10ki, who are always together and immediately say what they think, the 9ki don't say things to one another. So even when deciding to go places, they'll have discussions and weigh the pros and cons. Besides the early days, they've never had any big fights. In a way, the 9ki also envy the 10ki's closeness. Though if the 9ki get into a fight, it might come to fists. Iikubo pulls out 'nikibi' - 'pimples'. 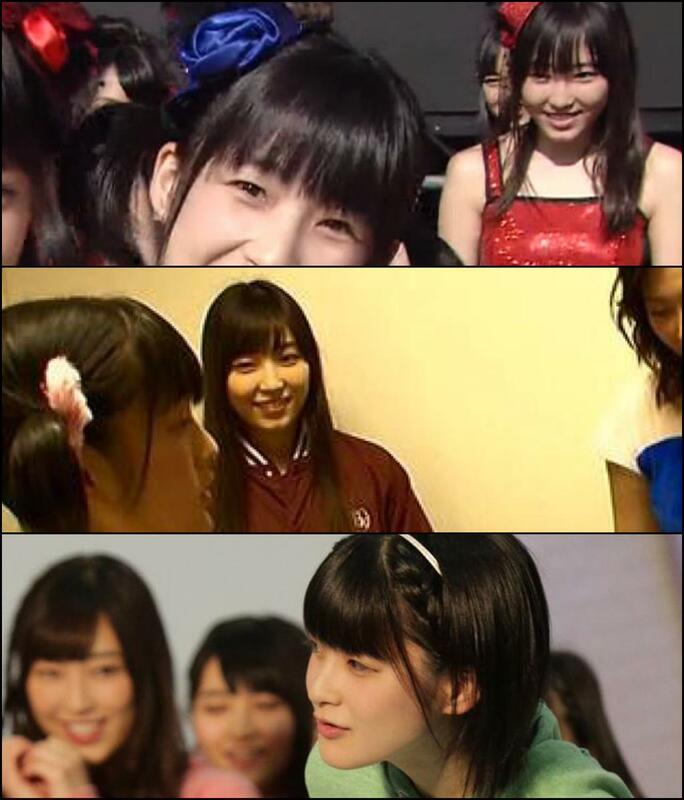 While Iikubo still gets pimples, this is something that has never troubled Sayashi. Iikubo remembers breakouts starting to happen when she turned 18, so she tells RihoRiho to enjoy her smooth skin while she can. Ishida pulls out 'Hatsukoi' - 'First love'. For Iikubo, her first love was in her first year of primary school - the super cool Echizen Ryoma, the protagonist of the anime 'Prince of Tennis'. She liked his voice and his cool looks, though she didn't actually follow the anime - she just made the judgement superficially. Riho feels that as anime characters are crafted, you can immediately figure out your ideal type. Plus, they don't change. By the way, Kujo Joutarou is Iikubo's ideal type. He's cool, yet kind, with an 8-pack. For Mizuki, she guesses that her first love would have to be... Tsugunaga Momoko-san. Since the only thing that interested her was H!P, she'd watch H!P videos and DVDs from morning to night, always watching Tsugunaga-san. Once she'd mastered Tsugunaga-san's dancing parts, she'd show it to her father. That was her life, up until she joined Morning Musume。 But once she'd joined Morning Musume。, she needed to be more aware of the world in general and started to watch regular television. And since she'd have to know about other entertainers, she also started listening to music by other artistes. Fukumura: So if you're talking about 'love', it's something that you lose yourself completely in, right? That was exactly it. Sayashi: You were head over heels for Tsugunaga-san. And a bell rings, indicating the end of the corner. They leave it to a certain person to introduce the song. Michishige: This song is a song that only I can sing! having said that, first, the lyrics start with 'I'm still cute even if I'm off-pitch'. I think that this is something that only I can sing. The song is really cute as well, and the music video is really cute as well, so I hope that lots of people will watch it. At the very final part, the lyrics go 'The time I spent together with everyone was priceless, a treasure', I really wanted this to get through to the fans. So I'm really happy that Tsunku♂-san gave me those lines. I'd like you to listen a lot to the CD, and I really sing it packed with emotions when I perform it at concerts. It's a really really precious song to me. 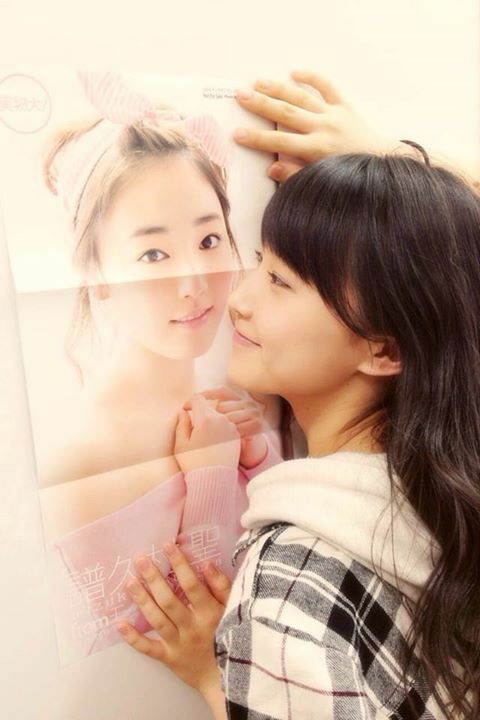 And so please listen to Michishige Sayumi's 'Shabadabadoo'! This was Michishige Sayumi. Next for the lyrics talk will be the final song: Mikaeri Bijin. This song was performed by 9 members of Morning Musume。´14, with Michishige Sayumi excluded. It was a song not produced by Tsunku♂-san, and they were surprised when they first heard that it would be enka, but once they sung it, they realised that the song really relayed their feelings. Teacher: I'm good at taking photos. Class: Seriously sensei? You're good at taking photos? Teacher: Uh, yeah, I am, I'm good at it. Class: Ah, if that's really the case, then show us your camera! It registered lightly on her mind, but Ishida was happy to that she was able to make a memory through the flow of the class, surprising as it was. In Riho's case, when she left Hiroshima, she was still in primary school. So she had free periods in her class schedule, which they'd often use for birthday celebrations or other events. 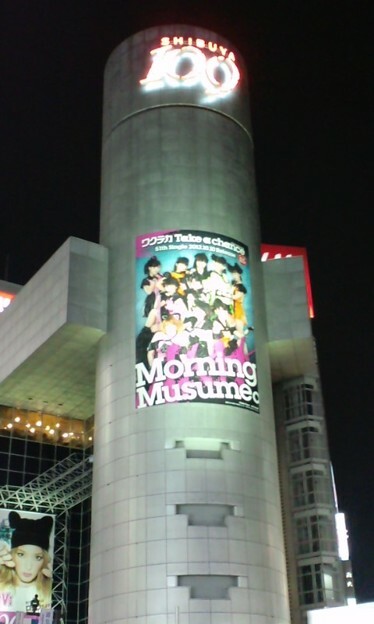 Before she left to Tokyo for Morning Musume。, they'd be using that for a party. Riho had her hopes up, as it was her last time there after all. When she got to the gym, it turned out that they had set up a mini-graduation ceremony for her, despite it being nowhere near graduation season. The moment Riho stepped in, everyone clapped, and Riho was asked to step forward to the centre. The class teacher and principal were there, and her friends had made her a handmade graduation certificate, and people gave her things and held performances. It made her really happy! The only bummer was that the songs they were singing in front of her were AKB songs though... But they put their hearts into it. Next, 'Ii Onna' - 'good woman'. Ayumi says that Harunan's the closest, and the reason for that? Harunan's birthday is November 7th, which can be read out as 'Ii Onna' using the magic of Japanese wordplay. And so, she always says that she aims to be a good woman during her birthdays. Mizuki raises this incident when she thought that Haruna was a good woman - Iikubo had bought lipstick in a new colour, and Mizuki thought that she was a good woman when she saw Iikubo using that colour. The current members generally use natural colours, but when Iikubo messes around with stronger colours, it makes her look grown-up. Fukumura: It really suits her, so it's no wonder that Harunan is our fashion leader. Well, now that those 2 hours are up, how did the girls find it? Mizuki enjoyed the opportunity to look back on their history from when the 9ki joined, while Riho points out that the lyric talk part had them discussing odd topics. Through the 'song that influenced your life' segment, Ayumi got to listen to songs that she wouldn't normally listen to. After all, when they're on radio, it'll usually be their own songs playing. And while she felt that there might be people who were aware of Miwa-san, she was glad for the opportunity to talk about her feelings regarding the song. Haruna had started out nervous at the beginning, being the chairperson, but as they got to the end of this long show, she noticed that she had loosened up. So she feels that she's grown since the start of the programme. And after a quick overview of their upcoming events, the girls bid us listeners farewell.